What have we learned? I think we've discovered - much like England in Test football - that we're not a million miles away from the best teams in the world. The best way to improve is to keep our hemispheres in competition like this, to generate those opportunities to test ourselves. Credit to the Roosters, who were excellent ambassadors for the sport, from their trophy tours through England to the expansion work and cultural trips to the Somme and Paris in preparation. Huge credit to Wigan too, who flew the Super League flag with pride, beaten but not bowed. Thanks for joining us tonight, it's been a pleasure. Good night. 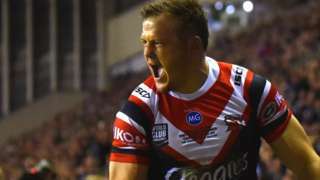 NRL champions Sydney Roosters beat Wigan Warriors 20-8 at the DW Stadium to win their fourth World Club Challenge title. While Wigan are pitched right back into the grit and grind of Super League action next weekend, the Roosters don't begin their NRL campaign until 15 March. What a way to kick it all off too? The Sydney Cricket Ground, against old foes Souths. Ryan Hall might be in the mix by then, having left Leeds for Bondi at the end of last season. Adding extra spice to matters is the possibility of Angus Crichton making his Roosters debut against his old team. I wonder if he'll be as successful an import as Luke Keary was from the cardinal and myrtle? What's next for the Cherry and Whites? There is a six-day turn around for Wigan to their next game against Hull FC, who are now without a win in 13 games going back to June last year. There will be some sore bodies after this one so rehab will be the order of the day, while Hull - despite naming a strong side for yesterday's reserve team friendly with Wakefield - have had a two-week break. The faces of genuine delight for those Sydney Roosters players are a really heartwarming sight, as it breathes massive life into the future of this competition. They even take a bit of time to sup champagne from the silverware, much deserved celebrations having taken on and beaten a really tenacious Wigan side. They've now taken it down to the small band of Roosters fans at the DW who have done their best to recreate the famous 'Chookpen' fans section in this chilly part of the north west. He lifts it high, the champagne sprays and the smile on Trent Robinson's face says it all... the Sydney Roosters are World Club Champions. "We're proud to get the win"
It is satisfying. It's a long way to come, as the Roosters playing ground it means a lot to us. We knew it would be tough, both sides play really good footy and we're proud to get the win. It was a tough challenge, we knew that. We were disappointed with the soft tries in the first-half but we showed a better display second-half and we can take positives out of that. "We knew they would be physical"
We knew they would be physical, we matched them but they didn't stop coming at us. When we got the two quick tries I thought we might run away with it but they didn't stop. It was topsy-turvy in the second half, they had chances to draw level, but we were gutsy in defence. I was at the 2012 World Club Challenge when Brett Morris scored twice to get man of the match as a St George Illawarra player, and he's followed that with a second honour for his hat-trick efforts tonight. He might have found it a bit easy for the first couple, but Wigan stood up afterwards to make it a really tough game. How good was that? It was nailbiting at times, stomach-churning and breathless. Thoroughly absorbing and gripping. What did the Roosters do well? Ran hard, had plenty of punch, kicked beautifully and were defensively teak-tough. How about Wigan? Stayed in the grind, scored some wonderful tries and caused the Roosters problems... it will take some team to stop their opponents. Trent Robinson's Roosters are winners... and a brave Wigan come away with nothing from their meeting of two hemispheres. Brett Morris' hat-trick and Daniel Tupou's last gasp try proves the difference for the Chooks, with Wigan showing flashes of class and a never-say-die attitude in their reply with tries from Tom Davies and Liam Marshall. No shame for the Super League side, but the Roosters show just how good they are, why they are the NRL premiers and why they are the world champions. Wigan go for the short drop-out but the Sydney Roosters claw it in and deny them a late flurry. Last tackle... kick behind... Oliver Gildart well-placed for Wigan to mop up. When Roosters have had the dead-set field position, they have punished Wigan and this was no exception. Having forced a repeat set off the drop-out, the Roosters get to within a couple of metres of the line. Luke Keary gets to the final play and hoists a kick to the towering Daniel Tupou on the left, pouches and grounds in one smooth motion and that IS THE BALLGAME. Roosters have the trophy in the bag. Hard on a very game Wigan. Wigan toss the ball to touch after a promising move, but it's the kind of 'go-for-broke' move they have to do at this stage. Roosters get the ball back. Five minutes left. It's raggedy but absolutely absorbing. Roosters force a drop-out... after a dangerous last tackle play into the in-goal. Daniel Tupou couldn't work out where the ball had gone, and the swipe behind was from Willie Isa. "We've got a game on our hands here folks. That's a cracking try from Marshall and just what the home fans were after. "That try has been coming and had Zak Hardaker not missed the extras, I think the momentum from that score could almost definitely have spurred Wigan on to victory. "There's still time, though, and the Roosters will have to do it in front of a hostile, partisan Wigan crowd if they are to hold on." Wigan get the ball back, Roosters under the pump.